The general arrangement (GA) or structural layout is a document that clearly specifies the disposition of the structural elements in a building such as the columns, beams, panelling of the floor slabs etc, on which the design of the structure is based. By looking at the GA of a building, other engineers can identify the model of the building, the shape and type of structural elements, and the possible assumptions made in the design. In order to carry out a design properly, the design engineer should be able to adequately idealise the structure in order to obtain the closest theoretical and practical behaviour of the structure under load. This interpretation is usually made from standard and well prepared architectural drawing of the proposed building. The architectural drawings enable the engineer to prepare what is normally referred to as the ‘general arrangement’ of the building, popularly called the ‘GA’ or the 'Structural Layout'. The GA also contains the labelling of the axes and members, unique grid lines, building structural levels, etc. After completing the GA, the engineer makes preliminary sizing of the structural elements which may be governed by past experience or by deflection requirements based on the code of practice. After the sizing, the engineer is faced with the challenge of loading the structure. But let us briefly review how we go about the GA. 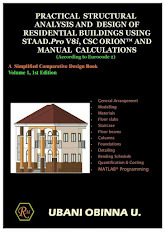 There are no prominent rules on how to select the appropriate general arrangement of a structure. To me, adequate presentation of the general arrangement has more to with years of design and construction experience. However, I am going to highlight some important guidelines which are very necessary. Respect the architect’s original disposition: In the preparation of a GA, try as far as possible to respect the architect's design. Architectural drawings supersedes structural drawings for building projects. For instance, when arranging your columns, do not place columns where the architect has meant to be a free space, and also, none of your structural elements should interrupt the interaction of spaces. In addition to that, your columns and beams should not project out where the architect has intended plain walls or sections etc. Just make your arrangement consistent with the original form of the structure. Select a stable model: The model or general arrangement you are presenting should be statically stable, and fully representative of the behaviour of the structure. There should be no stability or equilibrium problem at any joint or location in the building. Buildability and construction consequences: The model you adopt should be buildable. This starts from considering the technical capacities of the local contractors who will execute the design from your model. For instance, in a region where reinforcement bending machines and cranes are not readily available, you should not provide models that will require the provision of high yield 32mm bars, or recommend the use of precast or prestressed elements. Every construction project has a budget, and your designs should reflect that. For instance, I normally try my best not go beyond 16mm bars for simple residential duplex design, unless I cannot help it. I know I can achieve this only by moderating the span of my structural elements, since I know the live load in residential buildings are not much. Know the economic and structural consequences: Between more steel and more concrete, which one is more economical in the region? For instance, let us consider an external beam that should have been 8m long under simply supported assumptions. If there are no openings at the wall panels under the mid span of the beam, you can comfortably hide an intermediate column there, thereby having two spans 4m each. The original 8m beam would have required more steel reinforcements, or deeper sections, or both to satisfy ultimate and serviceability limit state requirements. However, if you introduce a column at the mid-span, there will be redistribution of stresses, with a hogging moment at the propped mid-span, and hence, generally lesser reinforcements, concrete section, and deflection. However, you should note that you are now going to construct a new column and new isolated base (requiring concrete, reinforcement, and additional excavation cost). Between the two options, which one gave you the most economical solution? Is the cost of constructing foundation in that area cheap or expensive? These are all influencing factors, and like I said, years of design experience counts. In this post, a small residential building on a 10m x 15m plot of land has been presented for the purpose of preparing the structural arrangement. The ground and first floor plans of the building are shown in the figure below. From the architectural disposition, the building is a two family occupancy arrangement, with each family occupying a floor level. The 1st floor of the building has a balcony at the kitchen, a cantilever sit-out, and a little balcony by the staircase area. Apart from that, the general arrangement is fairly the same. The architectural drawing of a building can come to a structural engineer in many forms such as hard copy or soft copy or both. If it comes as a soft copy of a CAD drawing, then the work is made easier and more accurate. If it comes as hard copy, then kindly request for the soft copy, otherwise you will have a lengthier job to do. So let us quickly run down through Structville's style of preparing GA when the drawing comes in AUTOCAD format. (1) It is advisable to place the ground floor plan side by side on the graphical user interface window of your CAD program (e.g. 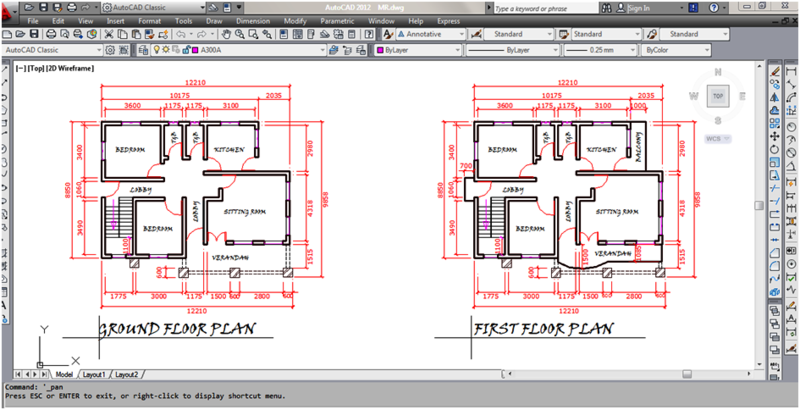 AUTOCAD) with the floor plan of the subsequent stories (see Figure below). Note that architectural drawings come with their own unique grid lines. In the current building we are trying to design here, some details (like gridlines) have been removed from the architectural drawing for the purpose of clarity of very necessary details like dimension lines. After placing the floor plans side by side on the window, you can start noticing a few different things about the floor plans immediately. (2) For more ideas on how to proceed, copy the floor plans to another location on the window (still leaving the ones you placed side by side for quick references). (3) Now, copy the plan of the first floor, and paste it on the ground floor plan, so that the dimensions and axes are matching perfectly. Just like I hinted earlier, grid lines are unique. Grid line (axis) A-A on ground floor still represents axis A-A on the 4th floor whether they contain the same elements or not. HINT: You should choose a prominent corner of the building as a pick up point for your copy and paste operation (this is to make your axis match more properly). For more clarity, you can change the colour or thickness (or both) of the ground floor elements and first floor elements and gridlines, so that you can rightly distinguish between the two, but do not mess with the drawing layers on your AUTOCAD. (4) After you have pasted the first floor on the ground floor, you can now see the interaction of the two floors. All axes with elements that are coincidental should be visible, and all axes with members that are not coincidental should also become visible. HINT: Architectural drawings can be clouded with lots of details. To help you see more clearly and make your decisions faster, you can turn off the layers of irrelevant details such as furniture, sanitary fittings, etc as appropriate. Whenever you get confused, look at the sections of the building for more information, and when the details provided is still not clear, you can contact the architect for more clarification. At this point, you can also see the outline of block work on the first floor, and this can be more critical for the general arrangement of the first floor slab. It will properly guide you on the selection of floor beam axis. Engineers usually prefer to have their major block works sit directly on beams unless they cannot help it. On the other hand, the block work axis of the ground floor will aid you on the design of the foundation layout, especially for the strips. Do not work on the ground floor alone without looking at the first floor – the last thing you will want to happen is to place a column somewhere on the ground floor, and helplessly see it popping out through the lobby of the first floor. So carefully make your selections based on matching axes, and fair uniformity. And as I hinted earlier, your arrangement must be consistent with what the architect has in mind. So this is much like an art, and you have to use your ingenuity here. "My supervisor during my industrial training once told me that preparation of structural layout is the one of the hardest things to do in structural design. Five engineers can prepare the GA of a building using the same drawing, and come up with five different layouts that are plausible. But critically, some solutions may be better than the others." (5) After studying the two floors, the next thing to do is to create a rectangular or square box (say 230 x 230mm) on AUTOCAD, and hatch it with any pattern appealing to you (I normally use SOLID). This represents your columns on the floor plan. Now carefully copy this element and start pasting it at the locations where you have decided to place your columns (this usually occurs at intersections between axes). Personally, I normally start at the corners of the building because more often than not, columns must be there irrespective of the arrangement. After that, you can move to the interiors and place your columns as desired. (6) After you are satisfied with what you have done, carefully check the interaction of the arrangement, and make sure that they are reasonable. At this point, you can start seeing how your floor beams will connect. Areas where primary and secondary beams will interact will now become visible, and this is another stage of critical thinking to see if there are better solutions and alternatives. Once you connect your floor beams as appropriate, the GA work is basically done. You can now 'fine tune' it, and add other relevant details. We wish to place columns along axis A-A. A little consideration will show that we can place columns at points A1, A3, and A5. Also, we can alternatively place columns at points A1, A2, A4, and A5. Without reading further, ponder on that arrangement and see the alternative that you will prefer. (1) I will have a larger span for A:1-3 and A:3-5. But note that the spans are considerably moderate for such RC structure in our case study. (2) I will have a floor beam running along axis 3 (the beam will probably have to run down to axis C before encountering another column support, unless I extend any other beam to act as primary beam to it). (3) The floor slabs on the bedroom and kitchen will be subjected to block work load from the walls on axis 2 and 4, which some part of it will be subsequently transferred to the beams on axis 3. (1) I will have shorter spans, and of course three spans instead of two. The bending moment on Span A:2 – 4 will probably be hogging due to its short span relative to others. (2) I will have a wall along axis 3, but by proximity and considering load sharing implication, it will not be critical, and will not affect my designs like the pervious alternative. (3) My floor beam at axis 2 will stop at axis B, and my floor beam at axis 4 will stop at the wall close to axis B. So I will not have a complex arrangement to deal with. Considering all these consequences, I preferred the second alternative. I feel it gives the building more robustness. However, if the building is to be located in area where the soil is so bad that constructing foundations will be very expensive, we can settle for alternative 1 since we want as fewer foundation points as possible. The final GA I adopted for the whole model is shown in the figure below. However, if the drawing comes in form of a paper work, then nothing changes in the approach. 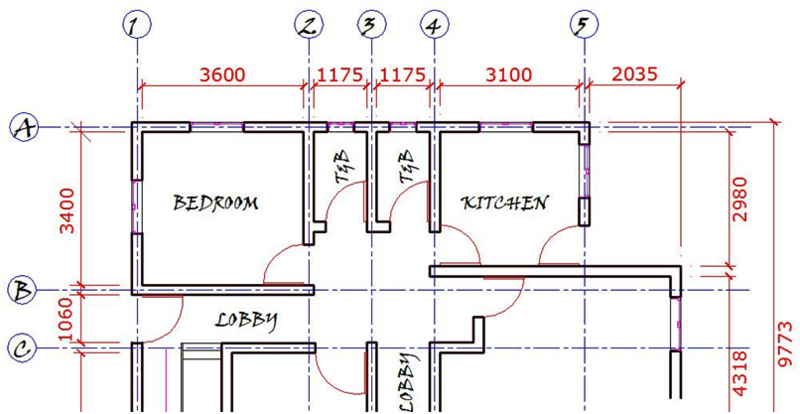 Place the floor plans side by side, and manually make your decisions as highlighted above, before you go into drafting. Thank you for visiting today, and keep checking back. Thank you for this knowledge. It is really helpful. Thank you once again.